The team over at Vembu are really making waves this year, having released v3.9 earlier back in January of this year (you can read about that release here but at a high level summary it introduced features such as Tape Backup Support, auto Authorization at the DR site, Quick VM Recovery on VMware ESXi for Hyper-V and Disk Image Backups, Windows Event Viewer Integration, Advanced Backup level encryption for all agents, OffsiteDR Server retentions and Pre/Post backup scripts for all Network & Image Backup clients. Now, they have released 3.91 which furthers their capability, fixes a few bugs and introduces a new flavour for their software. So let’s get into what is new in this version starting with the release of a new standard edition. What does standard edition mean for customers? Quite simply, standard edition is aimed for the small to medium sized enterprises that perhaps do not need the bells and whistles that come with the Enterprise edition, but are adfter a tailored cost-effective solution that still provides the business with the same trustworthy data protection capabilities. such as Instant File Recovery and granular recovery for Microsoft applications in Hyper-V and VMware environments. Along with some bug fixes, the fundamental differences between Vembu standard edition and the enterprise edition are there is no tape support in standard as well as no retention capabilities, persistent boot (no tracking on quick booted VMs) and Disk level recovery is not included in the standard edition. On the replication side of things there is no capability in standard edition (it assumes that SMB only have one site). Pricing for Vembu as we know is based on a per socket basis, so this means the Standard Edition for VMware Backup is priced at USD $216 USD socket per annum. If you require under six CPU sockets, you get an additional discount of 50% that could lead to USD $108 USD per socket a year. The Standard Edition for Hyper-V Backup is priced at $144 USD per socket per annum, and again if you need under six CPU’s ithe same discount applies working out at about USD $72 USD per socket a year. One last thing, Vembu are also holding a webinar in a few days time to discuss recovery use-cases, and more important why is recovery more important than backup. For more information on the webinar check out the blog link and this video link . Today is world backup day, which was created as a way to remind people of the importance of backups and to have them publicly pledge that they will start taking reliable backups of their data frequently. Working in this field for some time, I have also had my own share of losing data in the past (ironic given my profession) and not being able to restore. Interestingly enough, it is estimated that around a 1/3 of people have never backed their data up so are seriously exposed to data loss, and those who have backed up – chances are they havent tested these any may not be able to restore when needed. One study found that while 57% of IT managers have a backup solution in place, 75% of them were not able to restore all of their lost data when they tried to. To combat this and provide a reliable backup and restore solution to this ongoing problem, our friends over at Vembu are offering offer 10% flat discount on all new purchases of Vembu BDR suite by clicking this link. More on the Vembu front, with recent announcements coming on the licensing front as well as a new service program aimed at providing service providers a platform to offer Backup as a Service (BaaS) and Disaster Recovery as a Service (DRaaS) for virtual environments through the Vembu software. 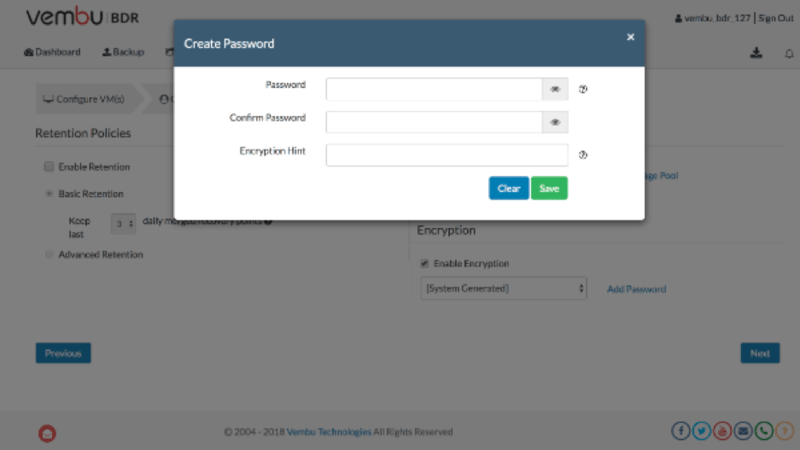 Service providers can leverage the native multi-tenancy functionality in Vembu to backup their VM’s by providing the Web UI access to their customers so that they can monitor their backup jobs individually and restore files and application data without the need to get in contact with the SP. Get a recap of all of the annoucements below! With launching the latest perpetual licensing, we look forward to availing more flexibility with the pricing. The Vembu BDR Suite which was earlier at the subscription pricing model will now be available at perpetual licensing, thereby helping IT environments fulfill their requirements that would cost less over time. In the aim of setting firm footprints across the globe by catering one of the most comprehensive backup and disaster recovery solution at an affordable pricing, Vembu unfolds it’s New Service Provider Program that would provide service providers a great scope for huge benefits and discounts with the Vembu BDR Suite v3.8.0. Addressing customers’ concern have always been Vembu’s top priority. The Vembu BDR Suite does comply with the new regulation and will make the users the real data owner. Complying with industry standards and policies has always been one of Vembu BDR Suite’s core attributes and the GDPR is no exception as well. Right now, Vembu can back up VMware and Hyper-V environments only – perhaps we will see integration into Oracle Virtual Manager in the future. Either way, they’re an exciting company to watch. Visit their site here if you want to learn more! Quick post to welcome Vembu as an official sponsor of cloud-land.com!!! 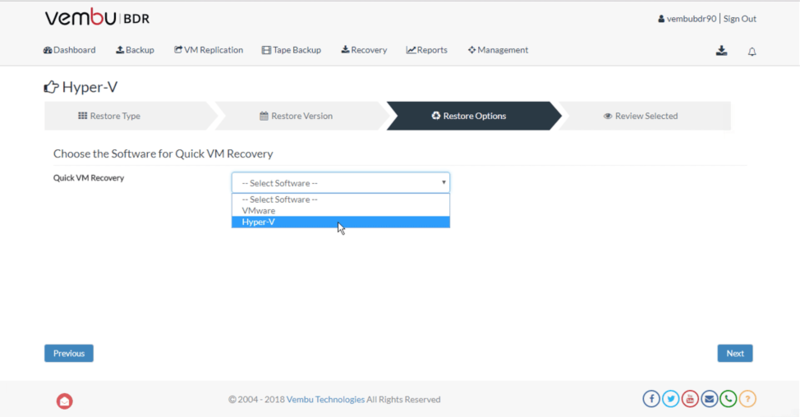 Vembu has been around for a little while and has been a quiet achiever in the backup and disaster recovery space covering backup for application sets such as Microsoft Exchange, SQL, SharePoint, Active Directory, Outlook, PostgreSQL, MySQL, Oracle. 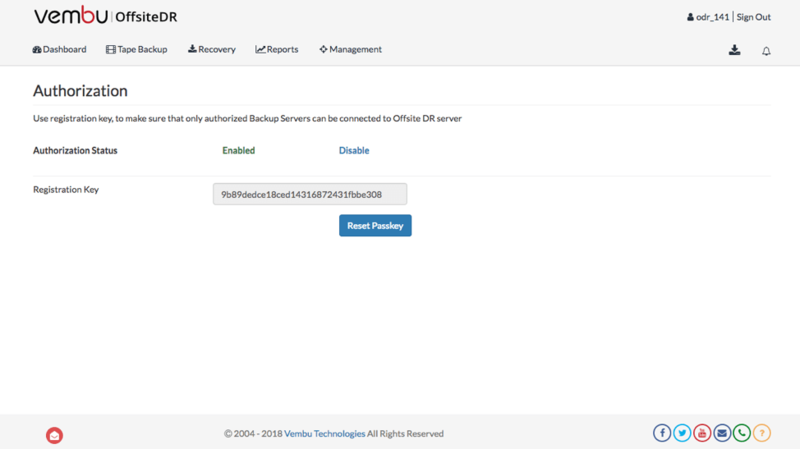 Veeam has recently announced “Veeam Endpoint Backup Free” to our portfolio of products, I am excited to share with you what Veeam Endpoint Backup is and what it is not. The release of this product is our showcase of our exciting innovation we drive at Veeam. Ok so what does this mean to virtualisation practitioners, home users etc? Let’s start with what it is. Veeam Endpoint Backup Free is a standalone product designed to allow users to back up Windows-based desktops and laptops, because while we believe that the modern data center should be virtual, we recognize that some devices – like desktops and laptops – only exist in a physical form factor. With this new product we will now make it possible for users to back up these types of devices. 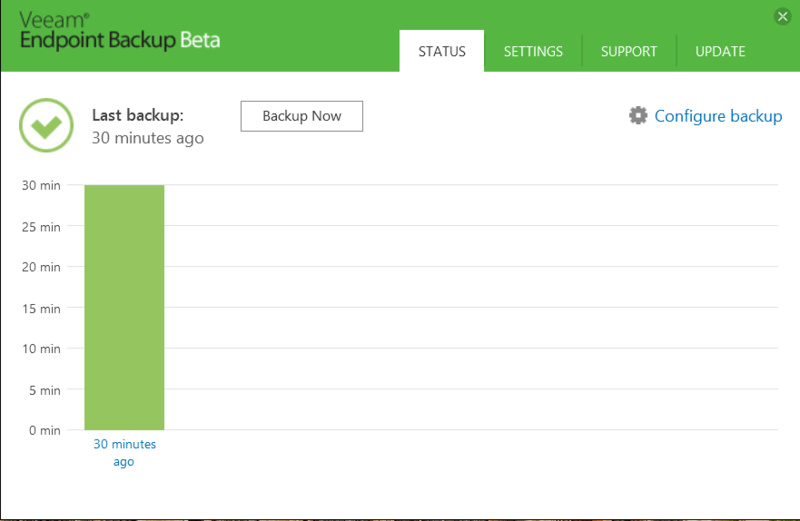 With Veeam Endpoint Backup FREE, you can easily back up your machine to an external hard drive, NAS share or a Veeam backup repository. And if you ever need to get your data back, there are multiple easy recovery options available. 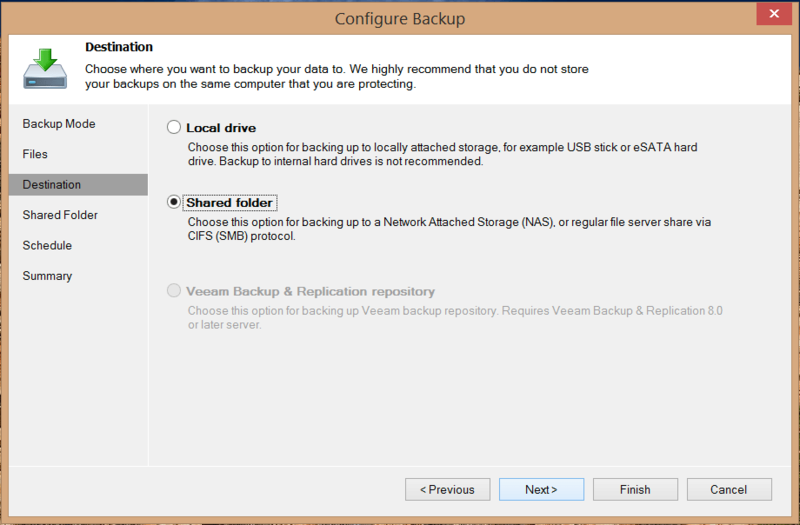 Veeam Endpoint Backup Free is designed to back up Windows-based desktops and laptops – it is NOT an enterprise physical backup server solution. It represents a new market for Veeam, and one that we are very excited about. 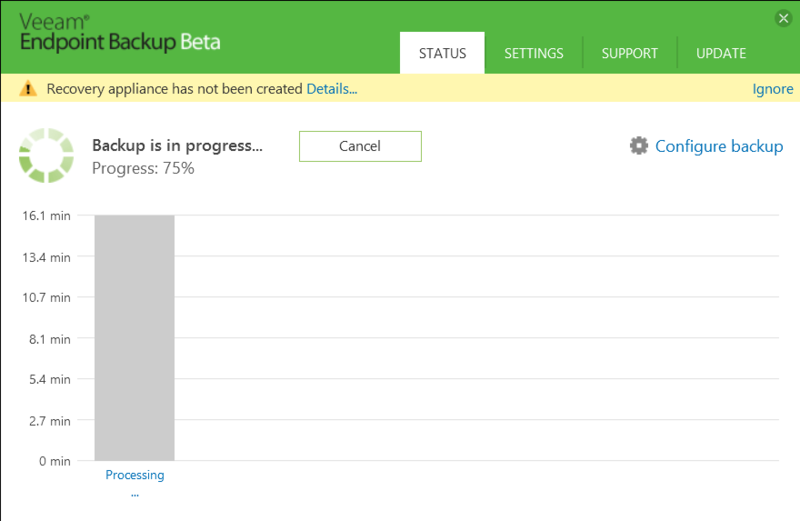 Best of all, Veeam Endpoint Backup Free is (if you haven’t caught on already) 100% FREE! Please visit http://go.veeam.com/endpoint to request a download link, you should get a response in a couple of days. Entire Computer – Backup all volumes presented to the local computer, this does not include Samba shares. 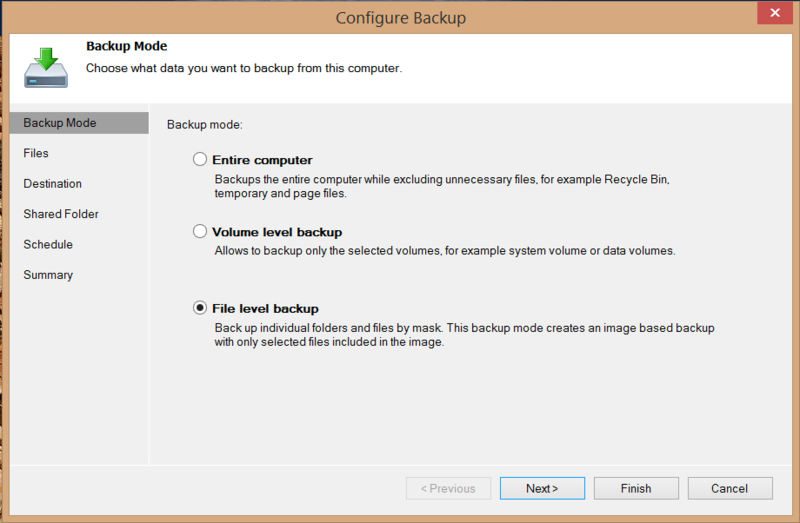 File Level Backup – Backup a sub-selection of folders and/or files within a volume. 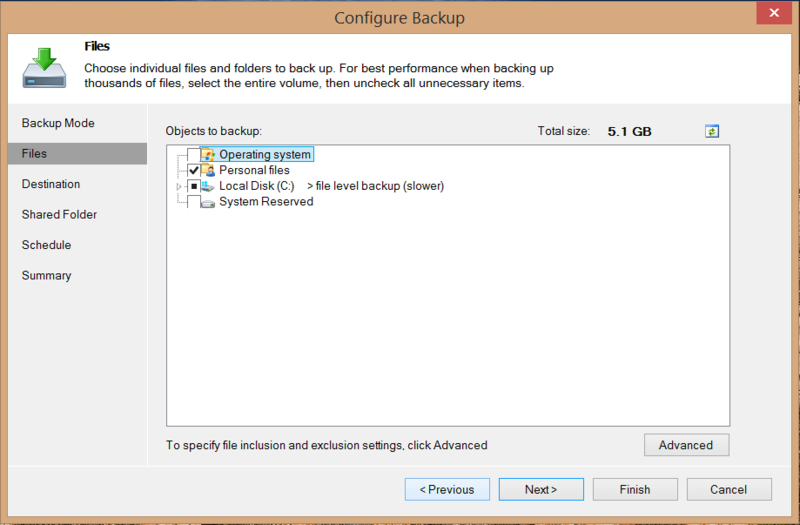 Once you have selected the type of backup you wish to do (I went for file backup as I do not need to backup the whole set of volumes presented to my virtual machine, you click next. This is pretty self explanatory, in the view I chose presents me with the local volumes (in this case the system drive or ‘C drive’ for the old timers). you can expand the folders and select a sub-selection of folders and files from here that you wish to backup. Once this is done, you may click next to select your target repository. Now select the type of repository (where you want to backup the files to) and click next. For NAS shares, select ‘Shared Folder’. For another drive (perhaps an External USB or similar) select Local drive. 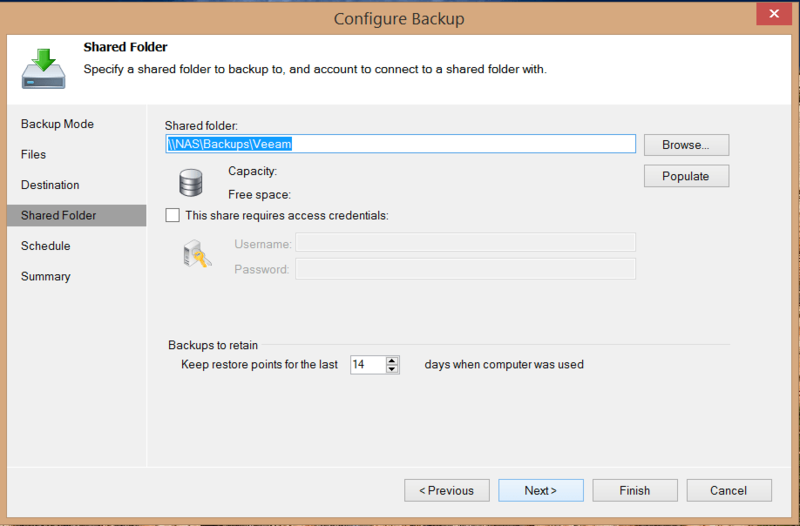 Select the location of the NAS share and enter your credentials if you need to authenticate. I selected my home NAS as a test repository. This screen is asking how often you wish to backup? For those backup bunnies, this should be driven by your home RPO’s you set out in your Disaster Recovery plan :). Finally, a summary page to confirm your selections. Once satisfied, click Finish! You can decide whether or not you wish to kick the backup job off immediately by ticking the box. Thats it! 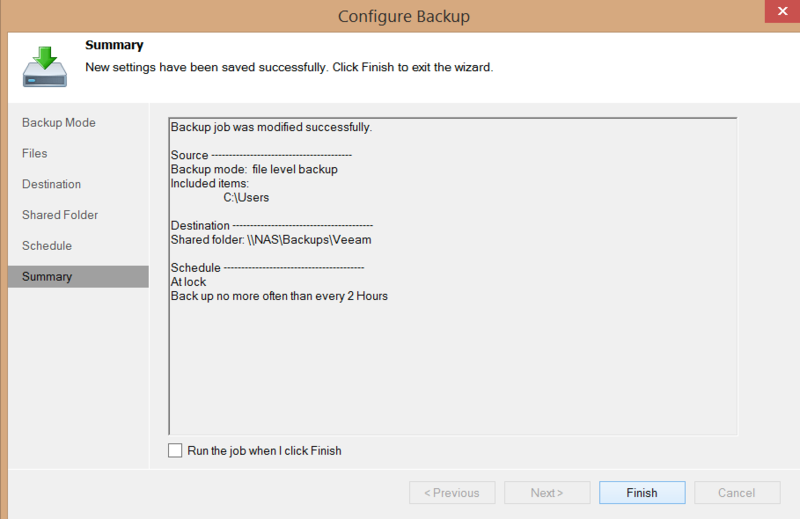 The backup job will start if you ticked the “Run the job when I click Finish” checkbox, if not, you can manually start the backup job at a later time. Wolah! Complete! 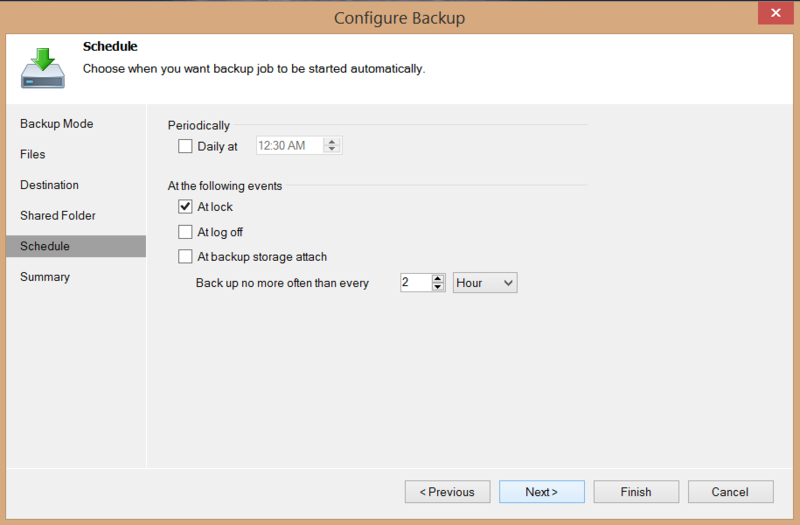 To configure a new backup, click the configure backup link again and refollow these steps. Please feel free to get in touch with me if you have any questions, in addition there are the Veeam Endpoint forums where other users will be posting questions and solutions to any queries they may have. 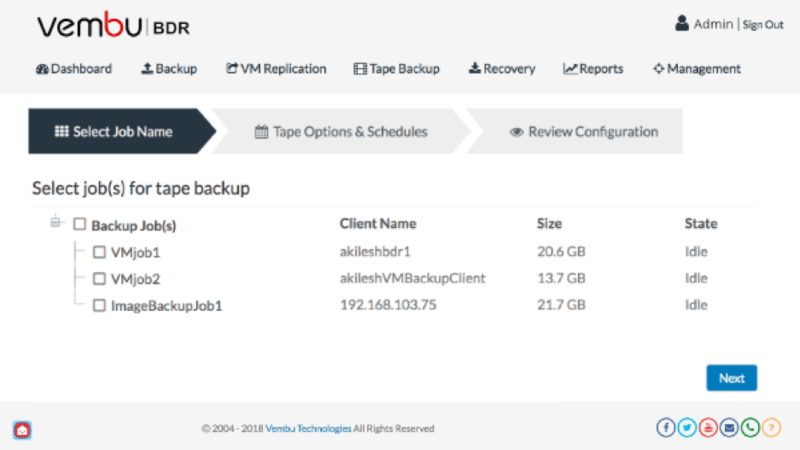 A look back at Traditional Backup and forward to the Cloud with ‘VeeamOn’. This year, Veeam is holding its first annual conference “VeeamON” focused on the evolution of Virtualization, the shift to the cloud, and in particular Data Protection and why now, more than ever data availability should be on the focus list of every single CIO/CDO across the globe. Why is data protection important? Let’s take a look at what workloads there were 20 years ago compared to now. Historically, Backup really revolved around tape – usually a single tape backup drive connected to a computer that would back up days and weeks worth of precious company data to a single tape. Backups could naturally take hours to complete, as did restores which were rarely tested and also had the potential to take hours to locate the right tape drive, load it into the tape unit and restore in the event of data loss. Some may argue that the process of backing up and restoring back then was fairly straight forward as there were purpose built devices with one job but the efficiencies in doing were so were absent. But in hindsight, there were (and still are) pitfalls in traditional backup methods, modern day features such as deduplication, compression, incremental block changes that have become a norm in storage and backup administrator’s vocabulary were not available to the business back then so things took time to complete. Eventually these features came but usually through having to purchase a new set of physical hardware or external device to perform the tasks which at times could prove costly. Virtualization was not the norm back then so servers were not portable containers and bare metals restores were 100% part of daily life for the various IT teams. 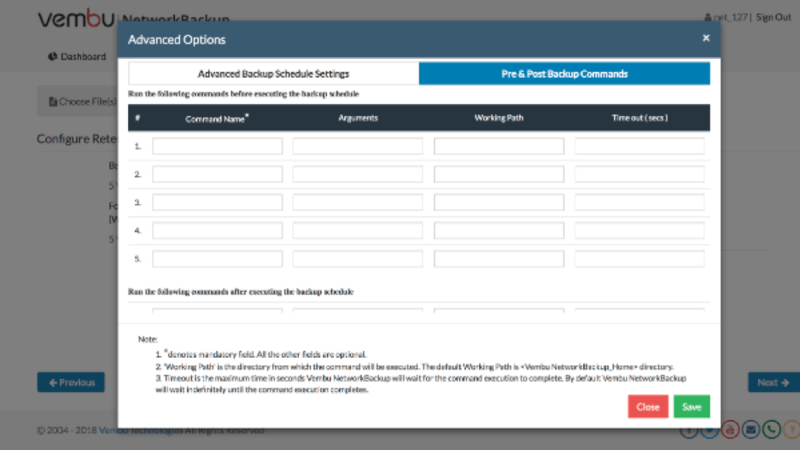 One thing that has not changed from legacy backup times is the reason why backups had to happen. To protect companies Intellectual property in the form of data and to ensure this data was online and accessible after a disaster – Availability. The important message I wanted to convey through these writings was availability has a cost associated with it when things goes wrong and SLAs are no longer being met due to hardware and/or software failures not to mention other unforeseen incidents such as human error (perhaps someone accidentally pulled the wrong cable out – it happens!) , Most storage and backup advocates know that, a lot of our day jobs revolve around making sure SLAs are met whether you are a company providing a service or a vendor selling technology that helps meet those SLAs. – They all tie back to availability and how quickly this happens. Take a look at this forecast released by Cisco entitled ‘Cisco Global Cloud Index: Forecast and Methodology, 2012–2017’ and in particular Figure 5. Workload Distribution and its accompanied Table 3, and just observe how massive the shift from traditional workloads to virtual workloads is becoming, of course this varies from country to country but as a general trend you can see the IT landscape is heading more and more into dealing with virtual environments as opposed to physical. In fact, this studies just verified that these days, virtual workloads are the norm and location, location, location also matters – whether it is based on-premise, or off-site perhaps in a cloud provider environment, these workloads still need to be protected at a local (site) basis as well as a off-site (replica) basis. With the newest version of our flagship product – Veeam Backup and Replication, Veaam is positioned perfectly to manage virtual workloads no matter where they reside. VeeamON is a three day event focused on modern day data centre availability, not just backup, not just DR but all encompassing and will feature some well-known industry speakers and analysts from companies such as Gartner and ESG. It is being held October 6th-8th at the Cosmopolitan hotel in Las Vegas. This event will host a series of quality sessions focused on modern day availability solutions and trends in the modern data centre that help form the “Always-On” story – Think back to the briefs I wrote about and why it is so important to remain always on!. Whether you are business focused, or technical – there will be valuable content catering for both business and partner streams so you can choose from a great variety of content. Veeam is giving away five free regular passes and one free VIP pass to VeeamON, all you have to do is to go here -> http://go.veeam.com/veeamon-free-pass and enter in your details. Next week HP is holding a two-day event that offers focused storage solution sessions in Macau starting on June 25th, HP is a very special Alliance partner for Veeam and I am honored to be attending and representing the Veeam/HP partnership. This will be my first event as the new Veeam Alliances Manager for Asia-Pacific & Japan so am really excited to be attending. Join HP partners and customers to hear from various HP Technical Experts and Leadership as they speak about the recent announcements from last weeks HP Discover event held in Vegas. Veeam APAC is also proud to be a Gold sponsor of this event, and will have a booth on-site that has the latest and greatest information on our software suite and its integration with HP Storage Products. If you are heading to this event, and wish to catch up. Please get in contact -> andre.carpenter@veeam.com.